﻿ I stumbled across this guy's blog a while ago, but I don't think I have ever mentioned it to you, Loyal Readers. JJ Harrison is an artist that has drawn some really wonderful, funny, LOST-inspired cartoons. He has an energetic, cartoon/illustration style and makes the Losties look bright and cheerful while also poking fun at the dark twisted aspects of the show. I never knew such a dark sci-fi drama with such complex, flawed characters could look so... well... cute! Even the Dharma shark and submarine are adorable. They're all worth checking out, especially if you were a Lostie. Be sure to start with his archives and be prepared to lose a few hours as you click through each one. Here's a link to the first cartoon he posted, to get you started. He also did a series of Star Wars/LOST mash-up posters, which actually ended up being a big hit with the cast and crew of LOST. I don't always like the whole mash-up idea, but these posters are amazing. I couldn't decide which one to post here, they're all so good. So, again, please click on his link, and check them all out for yourselves (or buy a print or two). He really is a very talented, funny guy. Now if you will excuse me, I'm off to boot up my Blu-ray disks of LOST. Namaste! After yesterday's post, it's time for something completely different. It's time for tea! ﻿﻿﻿I know you won't be surprised to read this, Loyal Readers, but I have an "Alice" guest bedroom in my house. It is decorated with all things that remind me of Wonderland. 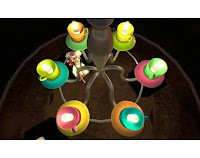 One day I was searching online for tealights, as in those tiny candles, and this came up in my results instead. When I saw this "tealight" idea, I knew I just had to figure out how to incorporate it into my room. This was the first example I came across. I like retro anything, but these cups aren't really my style, especially for my Alice room, which has a very Victorian flavor. Still, the idea is simple, whimsical and just perfect. I think they used an Ikea hanging pendulum light kit to make these. I imagine it would work just as well with some classically shaped, Victorian-styled teacups, although the thought of someone cutting a hole into the bottom of a fine bone china cup or their grandmother's heirloom cups makes me cringe. Once I saw this example though, the hunt was on! This next example looks like they took a regular wall sconce and fitted the teacups and saucers over where the shades should be. It doesn't look too hard, in theory, and the ceramic nature of the teacups would ensure they wouldn't catch fire. Be sure to click on the link to the site because they have a lot of other great ideas for repurposing old teacups into jewelry stands, bird feeders and even a giant clock. 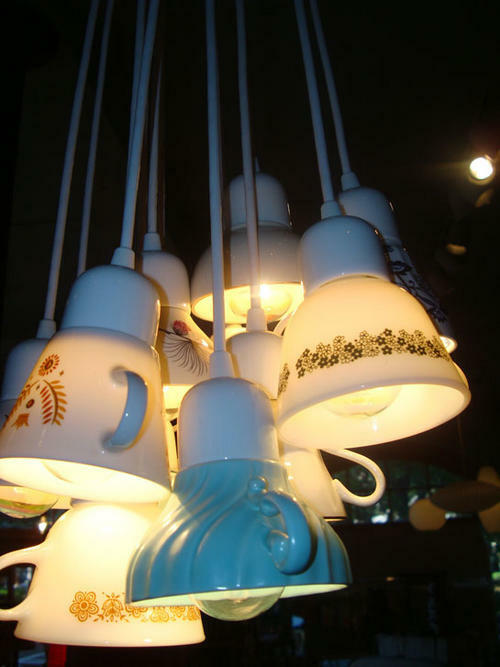 If you are handy and ambitious, you can make your own teacup chandelier using this tutorial on eHow. I love the fun, vibrant Wonderland-esque mix-and-match colors they used for their teacups. I could easily see this in a little girl's room. All this talk of easy do-it-yourself crafts like this makes me want to go out and buy a ceramic drill bit. However, I must admit that I'm not really handy when it comes to bigger, more intense crafting projects like this. I'd be afraid I'd end up with a table full of broken china and nothing to show for it. So which one of you has a generous spirit (and pocketbook) and would like to donate $200 so I can just buy this instead? It's been almost a year since I've posted here. And my, what a year it has been! Have you ever heard people say, "Be careful what you pray for"? The reason they say that is, for example, if you pray for patience, instead of God just snapping His fingers and magically making you patient, He will instead give you more opportunities (or at least make you more aware of the opportunities as they are happening) to learn and practice patience. Well, for a long time now, I've been praying and asking God to help me to be brave. Do you see where this is going? Let's get honest here, shall we? More honest than I probably have ever been on this blog, and more personal that I have been or probably ever will be. I struggle with anxiety, worry and fear. I have ever since I was a little kid in elementary school. I'm always worried that the worst will happen in any given situation. Well, this past year, the worst did happen. And you know what, I made it through to the other side. Not because of my iron will to pick myself up by my bootstraps, but because I finally surrendered control, or I gave up my delusion that I was in control. I submitted to God and recognized that He was the one in control, and what better person to be at the helm? He is a good and loving God. He is all-powerful. This is the guy who made the universe! Not only that, but He is the only one that offers true peace, true comfort and real, satisfying answers for the pain and heartache we experience in this world. You'll forgive me for being intentionally vague about the details. I don't do it to be mysterious or set your minds to wondering. It's because the details don't necessarily matter. The point is, with God, we don't have to fear. Yes, bad stuff will happen, but with God there is comfort. There is peace. There are answers. Over and over again in the Bible, God tells His people "Do not fear. I am with you." then He commands them to action. With God, we are already the victors, no matter what trials come our way. What a relief it is, to turn it all over to Him! After walking through that valley with Him, I felt a freedom from my fear. But God didn't leave me there. He kept working on me, teaching me how to be even more fearless and brave in my every day life, to live a life pleasing to Him. You see, it's easy for me to be brave for everyone else. I've done things for others that I would never do for myself. If need be, without hesitation, I'd lay down in oncoming traffic for my friends or family, but when it comes to making decisions or actions regarding myself, I'm so hesitant and fearful. Well, sure enough, God has placed a couple opportunities in my lap, to help me continue to learn how to be brave. Last week, I took the first step towards embracing them. I hope I can let the talents He's given me shine. I hope I don't waste the opportunity.